Very helpful, thanks! Overlapping labels have always been a problem, and playing with "nudge_x/y", "check_overlap", "h/vjust" and the like was suboptimal at best. "geom_label_repel" from the ggrepel package is also nice. Thanks for the post, Stephen! I had exactly this use case in mind when I developed ggrepel. Thank you for the post. unfortunately, like many other packages, i get "package ‘ggrepel’ is not available (for R version 3.1.2)" . When I update R to higher versions, I lose even more packages . Not sure if there is a way around this. so far, i did not find one. What do you mean "lose packages?" You'll just need to reinstall them. My guess is you're trying to install the package from a CRAN repo, but I do not believe it is available via repo at this point in time. You'll have to install it from source using the devtools package as was in the comments above. 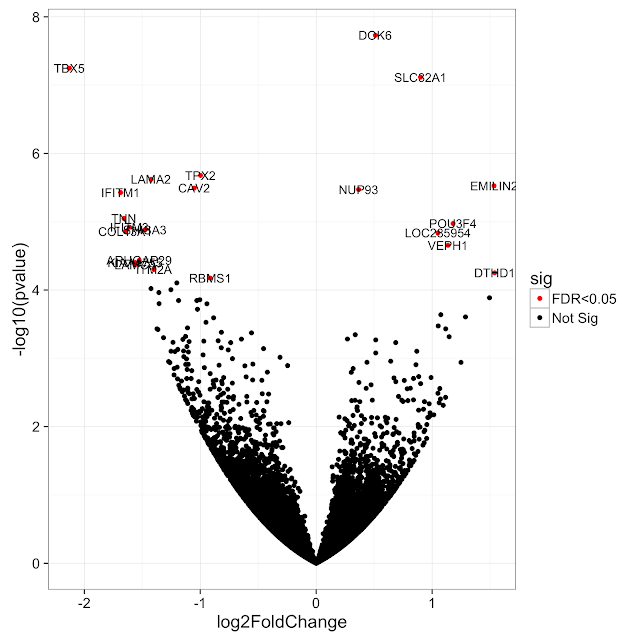 Dear Stephen, thank you so much for all your help, I am a beginner in R and I managed to get nice volcano plots for my RNAseq results thanks to you! I have followed all your steps but in my case I only want to label a subset of the significant genes in red, not all of them. How could I do that?